Therapeutically Gorilla Glue is recommended to treat the symptoms of stress, aches and pains, migraines, depression, anxiety, insomnia and lack of appetite. 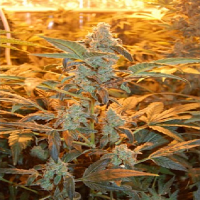 Gorilla Glue Feminized Cannabis Seeds by Lineage Genetics Seeds: Gorilla Glue was formerly used in some Lineage crosses such as Candy Glue, Strawberry Dessert and Pineapple Dynamite. This easy-to-grow strain is now available in feminised seed form. It has become very popular with medical patients at least in part due to its very high levels of THC. It is a cross of Chem Sister, Chocolate Diesel and Sour Dubb. 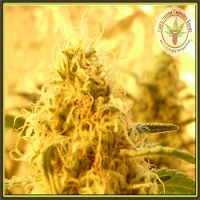 Gorilla Glue is a 50/50 indica/sativa hybrid which is suitable for both indoor and outdoor cultivation with the proviso that outdoors it is grown in a warm climate - the Mediterranean lands are ideal for this given the strength of the suns rays. Indoor flowering will take 8 - 9 weeks after which yields of 400 - 500 gr/m2 of very sticky, though dried, bud will be yours. 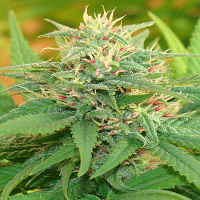 Outdoors 500 gr/plant would be the norm with harvest being ready during the middle of October. These incredibly sticky buds exude scents of pine, fruit and coffee while the taste includes notes of coffee, chocolate, spices and a trace of pine. THC production is very high and has been measured at 23% to in excess of 26% with CBD at 0.05% - 0.1%. Therapeutically Gorilla Glue is recommended to treat the symptoms of stress, aches and pains, migraines, depression, anxiety, insomnia and lack of appetite.